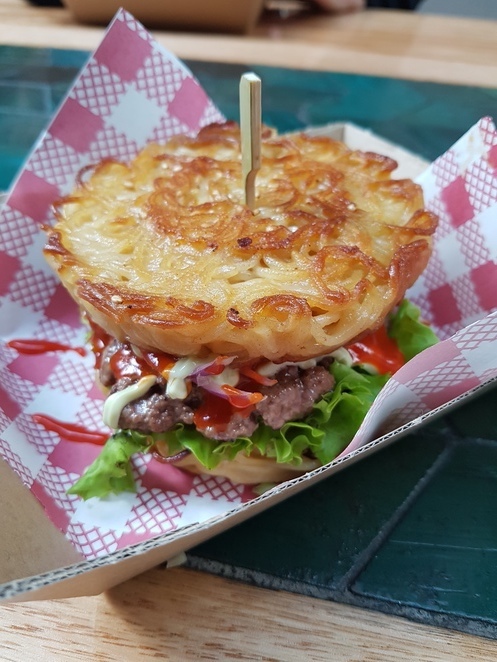 One Tea Grill's Ramen Burger is always such a hit at the noodle markets which typically equates to the stall always having an epic line. Thankfully I discovered that One Tea Grill is one of the restaurants nestled in Hawker Lane in Chatswood Westfield, which means you can try this Asian twist on a burger without the crazy queue. The concept of the Ramen Burger is that instead of having regular buns made from bread, the "bun" is basically two ramen patties. Inside the burger are your typical burger fixings of a beef patty, onion, lettuce and tomatoes with a splash of Asia with matcha mayo and siracha (there is also a tofu version for those of you who don't eat beef). This unique burger will set you back $15 on its own, otherwise you can get a meal deal for a little bit more which includes chips and a drink. Once you order, they will hand you a buzzer so you have time to find a seat in the food court while your meal cooks. When our buzzers finally buzzed for us to collect our burgers, we are a little sceptical that it would fill our grumbly stomachs but as you begin to eat the burger, you realise how filling it is because those compact ramen buns unravel to reveal lots of noodles! It's not the easiest burger to eat and I ended up eating it with a knife and fork, getting the crispy noodles on the outside, the softer noodles and the fixings all in one tasty bite. I actually don't like matcha but it must be a very subtle flavour and I wasn't able to taste it but did like the sauces on it. Along with the ramen burgers, they have other novel dishes on the menu such a cookie shots. Definitely worth a visit.